Hiddush - Revolutionary conversion ruling? Originally published in The Times of Israel HERE. “Revolutionary ruling on conversion,” read the top headline of a leading [Hebrew] Israeli newspaper last week. The article described a decision by the Jerusalem district court that ordered the Ministry of the Interior to register as Jewish a woman converted by a Modern Orthodox rabbinic court, operating outside the auspices of the Chief Rabbinate. This dramatic top headline was matched by another in the Ashkenazi Haredi party’s newspaper “Yated Ne’eman” titled: “Egregious breach in the walls of conversion.” The truth is more complex. This ruling is neither revolutionary, nor an egregious breach. At the same time, one cannot underestimate the importance of this development and what is yet to unfold. 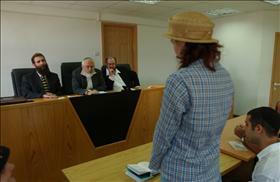 The conversion was conducted by “Giyur K’Halacha,” a Modern Orthodox conversion court network. Driven by a sense of mission and urgency, they launched an alternative avenue for conversion. They were reacting to an increasingly fundamentalist and rigid Chief Rabbinate, whose sponsored conversions do not even reach the rate of natural growth of non-Jewish family members of immigrants from the former Soviet Union. These individuals are usually eligible for Israeli citizenship based on paternal Jewish lineage, but since their mothers are not halakhically Jewish, they too are not considered Jewish. Current official numbers quantify them at more than 350,000, and through birth and additional aliyah — this number grows by approximately 8,000 a year. While these men and women perceive themselves and are viewed by those around them as Jewish, the state does not recognize them as such, and they are registered as “others.” More severely, they are denied the right to legally marry in Israel, for the Rabbinate refuses to marry them, and in Israel (in contrast to every other democracy in the world), there is no civil marriage alternative. The court’s ruling applies only in the civil arena. Thus, because the Chief Rabbinate (which controls marriage of Jews in Israel) does not recognize her conversion, she is not considered Jewish for purposes of personal status; therefore, she cannot get married legally in Israel. This ruling is made possible due to the fact that there is no law (still, thank God) granting the Chief Rabbinate exclusive authority over conversion. Since the 1960s, the Supreme Court has consistently ruled that the Chief Rabbinate has neither monopoly nor special privileges regarding the civil aspect of “Who is a Jew.” Israel’s politicians, on the other hand, keen on buying the votes of the ultra-Orthodox parties almost at any cost, submit to their extortionist dictates. These politicians make sure that the state’s legal representatives obstruct (as much as they can] the path for (even civil) recognition of these conversions. So there is nothing revolutionary about this decision. The irony is that the Orthodox “Giyur K’Halacha” rabbis gain recognition for their conversions in the face of the Chief Rabbinate’s strong opposition thanks to the battles I was privileged to participate in, arguing successfully for the recognition of Reform and Conservative conversions. Comparable decisions have been rendered by Israel’s civil courts over the last 20 years. What has recently emerged has been the realization that Modern Orthodoxy too, whether in Israel or in the Diaspora, is illegitimate and despised in the eyes of the Chief Rabbinate, just like its Reform and Conservative sisters. The rabbinic establishment’s battle against Modern Orthodoxy is often harsher, in fact, for its challenge is presented under a halakhic cloak. The revolution, therefore, is not about the ruling, but rather it is about the unfolding reality in which Modern Orthodox rabbis, intellectuals, and organizations are gradually coming to realize that the time has come to cooperate with the non-Orthodox streams. In the absence of a critical mass, which could fight against the stranglehold that Haredi political and rabbinic leadership exert over the religious establishment — they too find themselves vulnerable and excluded. The growing religious extremism is not limited to the realm of conversion, but also impacts on kashrut, gender, Shabbat, and much more. I welcome the Giyur K’Halacha initiative in taking on the Chief Rabbinate, but I greatly regret that its rabbis have not yet internalized the imperative conclusion: either there will be religious freedom and equality for all, or else Modern Orthodoxy too will be discriminated against. I hope that the day is not far when they will join the leaders among the Modern Orthodox who have already signed on to the Vision Statement on Israel as a Jewish and Democratic State, which aims at mending the reality from its very foundations, anchoring it in the principles of religious freedom and equality. As important as solving the registration matter is, the only true solution is granting freedom of choice in marriage, a solution that is supported by the overwhelming majority of Israel’s Jewish population and is recognized as self-evident in all other democracies in the world. Where do Israelis stand? Hiddush’s 2018 Israel Religion & State Index clearly demonstrates that the public opposes a Chief Rabbinate’s control over conversion. Only 25 percent of the adult Jewish population supports the Chief Rabbinate’s demand that it should be the sole authority to determine which conversions should be recognized in the State of Israel. Further, 70% of the adult Jewish population support formal governmental recognition of freedom of choice in marriage and acceptance of civil and non-Orthodox religious marriage alternatives as equal. How, then, should Diaspora Jewish leaders read this account? I suggest that it be an urgent wake-up call for concerted efforts to forge an Israel-Diaspora partnership of those forces that share a vision of an inclusive, pluralistic, Jewish, and democratic Israel. This is clearly the desire of Israelis who, as reported in the Index, invite partnership in confronting this challenge. As the “Who is a Jew” battle will shortly be reignited, it is important to stress that 68% expressed support for Jewish Federations and other organizations among Diaspora Jewry acting to strengthen religious freedom and pluralism in Israel, such as: advancing freedom of choice in marriage, ending the Rabbinate’s monopoly over conversions etc. One cannot over-exaggerate the ominous nature of the ultra-Orthodox opposition to this ruling. Ashkenazic and Sephardic Haredi politicians, alike, have reacted harshly, announcing that they will demand legislation to give the Chief Rabbinate authority over all conversions in Israel. They go beyond increasing religious coercion and strengthening the Chief Rabbinate’s monopoly. They target the civil judiciary in general and the Supreme Court in particular, aiming at castrating and silencing it. They desire a Torah-state instead. With that in mind, one can easily understand the reason and significance of the fact that 66% of Israel’s adult Jewish population (per the 2018 Israel Religion & State Index) want to see Israel governed by a civil coalition government without the ultra-Orthodox parties. Gafni and his associates are not only a threat to those who wish to convert and to Modern Orthodoxy, they are a threat to Israeli democracy, to the rule of law, to the independence of the judiciary, and to the future of the partnership between Israel and world Jewry.